Can anyone tell me what this part is for? Can someone tell me what this part Is for? It appears to be a “Low Dropout Regulator”, but I have no clue what that means. I believe the upper value is the part id and the lower value is the date stamp (‘Q’ usually means ‘quarter’). It looks like it’s eaither broken off or the soldering machine didn’t put it on correctly, but it’s hard to tell. and this probably wouldn’t be the best thing to learn on. but I don’t know if that would void your warranty or not. We will have to wait to see what @jonne says about the issue. Ok… Thanks. 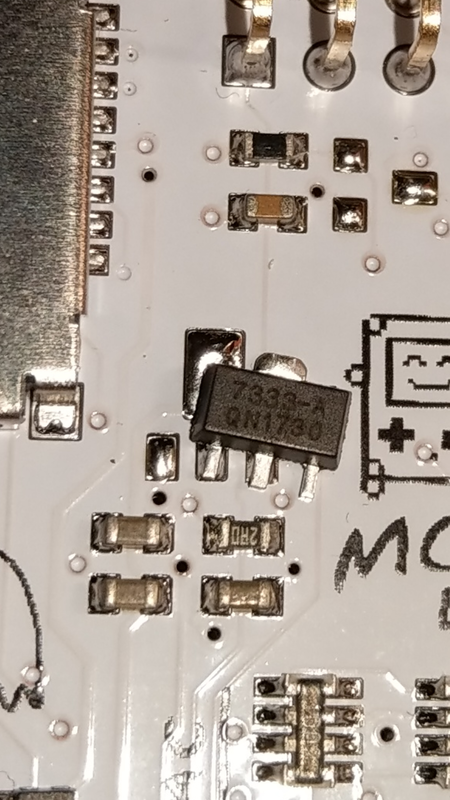 Well I am not able to solder it and I have Noone to solder it for me. Let’s hope Jonne can help me out. I haven’t had time to look at the schematics yet. If its the low dropout LDO, its the LDO for the real-time clock. Okay, thanks Jonne, if you need my address just message me.